REACH (Remote Electronic Access & Control - Hands-Free) is a system that will allow you to control dozens of products in your home independently without the help of a nurse or caretaker. 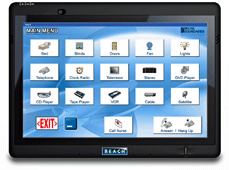 REACH is different than many other EADLs (electronic aids to daily living), providing a screen so that you can actually see all the commands available rather than memorizing the entire menu. You can also use a large variety of input methods to control the REACH ECU. These methods include touch control, voice control, head control, eye control and switch scanning (which will allow you to control the system using the slightest of movement in just about any body part). With REACH you can control all of the products below without the help of a nurse or caretaker. This can all be done by touching a screen, or completely hands-free by moving a body part, or simply speaking a command. Blinds & Shades & More! A beefier version of the REACH ECU has been developed known as REACH Beyond. REACH Beyond has all the benefits of the original ECU with additional RAM and Hard Drive capacity for resource hungry add-ons such as Dragon Naturally Speaking. Although the REACH name denotes "Hands-Free," it does give you or your loved one the ability to control their environment by touching the screen. The system is a good match for people with either gross or fine motor skills. For example, on-screen buttons can range from a half-inch wide, up to 8 inches wide resulting in a solution for people with even the slightest range of motion in their hands. REACH will allow persons with disabilities to control devices using their own voice. Just speak a command and REACH will send the command to the device you would like to control. Say "Door Open" and the door will open for you. Say, "Call John" and the phone will dial John's phone number. Even if your voice is somewhat weak at different stages of the day, REACH will understand your commands. And unlike many other EADLs, REACH may only require 10 minutes of voice training. REACH will allow people with disabilities to control devices using even the slightest head movements. Just focus on a button for less than a second and REACH will send a command to the device you would like to control. This is the perfect solution for people with severe disabilities that not only affect body movement but also affects voice. If you can move your head less than one inch, REACH with Head Control will work for you. REACH will allow people with disabilities to control devices using any type of assistive switch. If Touch, Voice, or Head Control is not a match, REACH will allow you full control with slight movement of any body part. REACH will simply scan through the options available and when your desired command is highlighted, press the switch. This allows full control with the foot, knee, or elbow. It can even be used without actually touching a button such as slightly moving a body part or puffing on a straw. One command can trigger numerous functions, i.e. "all lights off"